The score contains a 6x6-inch color image of eight different nebulae, with of a set of integers superimposed on each image. Each of the images is displayed on a single page and represents one section or movement of the music. Nebulae, which often contain bright colors and interesting shapes, are interstellar gas clouds located within our Milky Way or other galaxy. Nebulae are typically the remnants of exploding stars. 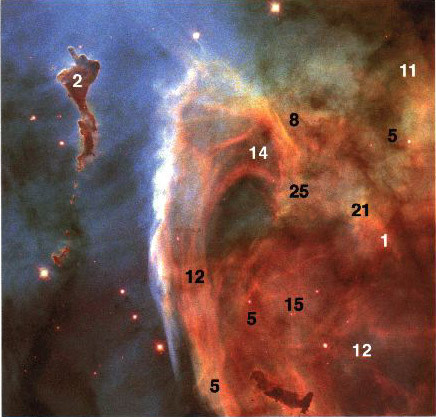 Astronomers believe some of these colorful gas clouds to be the birthplace of infant stellar activity. Images of the eight nebulae displayed in the score were photographed by NASA's Hubble Space Telescope from Jan. 1996 to Dec. 1999, and made available to the public by The Hubble Heritage Team at NASA. The name of each nebula is listed below and to the left of the image, and the month and year it was photographed is displayed on the right. The integers used in the score were drawn from the names of the eight nebulae. The integers placed on each image were determined by the letters in the alphabet which spell-out the name of each nebula. The letter 'a' corresponds to the number 1, the letter 'b' to 2, and so on. Play a sound-group for each integer located within the image. Integers represent the number of sounds to be played for each sound-group. Each integer corresponds to a single sound-group and indicates the number of sounds to be played for that group. Larger integers may be subdivided for ease of counting. Read all integers once only. A sound-group may contain a succession of single tones, chords, or any combination of both. Sound-groups may consist of varied and contrasting patterns, melodic patterns, rhythmic patterns, ascending and descending patterns, shaped phrases and gestures, repeated patterns, repeated tones, etc. Musical elements for each sound-group such as pitch, dynamics, speed, rhythm, and articulation are free. Integers are both white and black to contrast against the background for better readability. However in sections 1, 2, 3, and 5, where both white and black integers are displayed, the player may or may not assign any musical distinction to the contrasted integers, such as soft-loud dynamics, high-low pitch register, legato-staccato, etc. Any chord, arpeggio, glissando, double-stroke, trill, duplet, triplet, etc. counts as one sound. Grace-notes are not counted. Play each sound-group independently of any other. Any sound-group may or may not be followed by a silence. Fractional silences may occur within a single sound-group. Overall, silences between sound-groups and between sections (nebulae) should be varied to preserve the continuity of the music. Varied silences should range from a fraction of a second to several seconds. Integers distributed on the page may be read in any order, but are most easily read from top to bottom. Movements are read sequentially (from 1 through 8). The images are to be projected in succession (Nos. 1 - 8) on a large screen, so that both the player and the image may be seen from the audience. Each image is to be projected on the screen for the same duration the music for that image is being played. An accompanying CDROM disc is included with the score. The disc contains screen files (jpeg) of the eight images, which may be loaded onto a MAC or PC hard drive. The computer is then connected to a digital projector. Any slide-show software, such as PowerPoint, can be used to project the images. Optional: Signal processing devices or techniques may be employed as timbral enhancement to the music. In general, the Piano should be dominant, while the electronically processed sounds play a more supporting role.